The discovery confirmed that rock arts could not only be found in Europe but also in Asia, I Made Geria, the head of National Archaeological Research Center (Arkenas), said on Thursday in Jakarta. "The potential of this past civilization relics should be seen as a cultural capital to advance our country's cultural wealth," Geria said. Intensive research on the rock arts began in 2014. Since the 1990s, the peninsula has been known to store a series of ancient images, including thousands of depictions of human hands (stencils), animals, abstract symbols, and interconnected motifs. The peninsula is described as an area surrounded by towering limestone hills and steep cliffs. There are limestone caves covered by dense tropical forests at the bottom. The discovery was also published in the international scientific journal Nature under the title of "Palaeolithic cave art in Borneo". "We hope that this research will be deepened to their creators. If fossils are discovered, it will be a good spirit for us all," Geria said. 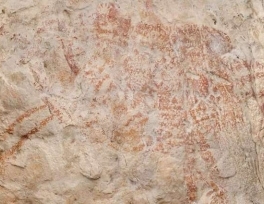 The paintings were discovered by a team of 15 archaeologists from Arkenas, Bandung Institute of Technology (ITB) and Griffith University Australia. Adhi Agus Oktaviana, one of the researchers, said the oldest painting is a large-sized orange animal, a species of wild bull which can still be found in deep Borneo Forest. After examining it with a geometric dating method, the painting is discovered to be 40,000 years old and declared to be the oldest figurative cave art found on earth. The second painting is hand stencils filled with dots and lines which forms a picture of a tree, which might be a symbol of family relations. It's estimated to be at the same age as the first painting. 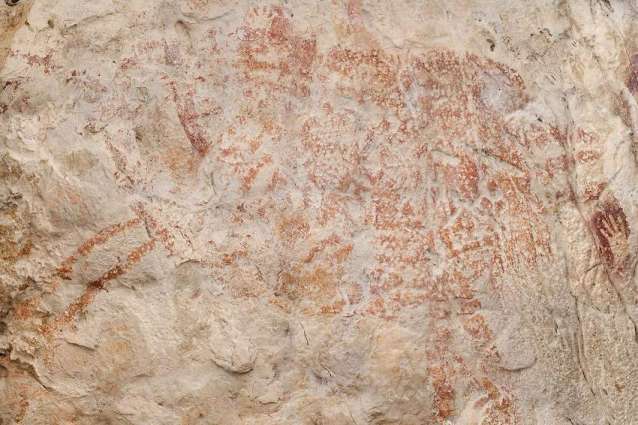 "This gives the impression that the tradition of palaeolithic cave painting first appeared in Borneo around 40,000 to 52,000 years ago," Oktaviana said. "Who are the artists and what happened to them is still a mystery," he added. The youngest painting is a 4,000-year-old figurative ship with anthropomorphic and geometric patterns engraved with black pigments. Indonesia's Education and Culture Minister Muhadjir Effendy will propose the area to be registered as UNESCO's world heritage site as it stores the oldest figurative cave art. Effendy invited the archeologists around the world to continue research in the region since it hosts lots of mysteries to be revealed.